Most of your body's activity is managed by an exchange of information that happens at a level below conscious awareness. Every second an estimated 400 million impulses of information are processed by your body by the 70 trillion cells that make up your body. To communicate this information, there is a space between your cells called the “Regulation Matrix”, which is composed of ground substance that is organized with fibroblasts, nerve endings, lymph, mast cells (allergies), mesenchyme, etc. to facilitate communication between your cells, nerves, and blood vessels. As a result, the regulation matrix controls the inflow and outflow of nutrients, waste and information between the tissues and organs of your body. As a result, your entire body functions in a coordinated and healthy way. This technology eavesdrops on this energetic inter-cellular communication by monitoring the minute electrical changes in Galvanic Skin Response, the same technology used for over a century in equipment used for bio-feedback and the polygraph test. Much like the polygraph; this technology sends stimuli to the body and measures the response. It does this by converting computer data representative of different items such as foods, nutrients, microbes, chemicals, hormones, etc into what are called virtual stressors. We then output these to your body and measure your body's response. It is FDA registered as an EAV (Electro Acupuncture according to Voll) device that non-invasively and at no risk screens for subtle energetic responses to electronically imprinted frequencies described above. 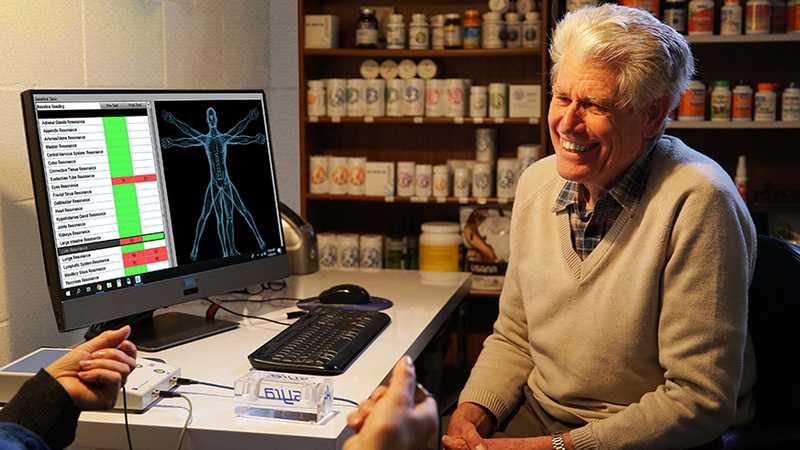 By energetically connecting you to the Idoscan thousands of specific frequencies that correspond to physiologic materials can be presented to you for your response. As a result of comparing your response to these specific frequencies, the Idoscan can rapidly assess energetic imbalances in your physiology and/or the presence of toxicity. Here's how it works - if a frequency from the computer encounters a molecule that shares its frequency, then "resonance" occurs, such that the return signal of that frequency will register as a voltage drop. This signifies that the entity "looked for" by the specific frequency is or has been present in your body. One can think of resonance in the same way as an exact note will shatter glass. While several Bioenergetic testing devices are available, the ours stands out for its automation, use of actual substances for resonance signatures, and clinical endorsement by some of the finest clinicians in America. I anticipate the Idoscan will provide deeper insights, faster and better outcomes, and reduce the need for prolonged medications and supplementation. Each session begins with a survey of the status of your organ systems. Although some systems test individual acupuncture meridians, it tests the organ systems without the need for precise location of points or application of pressure to get reproducible results. By determining the stress points first, the Idoscan can focus on what matters most at that moment. This is fundamentally different than other equipment that simply tests everything and does not prioritize your needs. The difference in approaches is dramatic. It is the difference between data and insight. adjustments, environmental modifications, etc. It formulates and imprints the exact frequencies into a small bottle of potato-based vodka and de-ionized purified water. This homeopathic remedy will carry the frequencies to harmonize your energetic imbalances. The process is similar to downloading songs onto an MP3 player. The whole process takes only about 5-10 minutes and is performed in our office by one of our staff. You will then be given a 1 ounce bottle containing Resonance Formula solution to be taken home. Typically the dosage is 5-10 drops put under your tongue twice a day. It is best to take the drops without food, toothpaste, gum, etc. Like all homeopathic remedies, shaking the Resonance Formula against the palm of your hand for 10 seconds before use markedly increases its effect. Keep the bottle away from electronics (cell phones, i-pods, pagers, magnets, x-rays, etc) to avoid external imprinting. Because homeopathic remedies serve as catalysts for change (just like a light switch will turn on lights as long as you have operational bulbs), there is the potential for a detoxification reaction with your sublingual drops. In fact, a reaction is often a confirmation that the homeopathic agent is addressing an important condition. If you experience a detoxification reaction, reduce the number of drops for a few days and then resume the original dosage. The homeopathic remedy should be continued as long as indicated on the bottle (3-6 weeks usually). When the prescribed duration has been completed, call the office to schedule a follow-up evaluation. Don't be concerned about missed dosages or a short delay before retesting/reformulation. It is not possible to determine how many evaluations are necessary as it depends on your life experiences, exposures, genetics, and energetic nature.